This post is an article written by Lauren Bersaglio and it focuses on the Boxes of Love project and the impact it has on the children of Villages of Hope. We would like to thank all who have been involved in Boxes of Love – this is dedicated to you! Do they bring their kids along every year? Another reason the Eckert family takes part in Boxes of Love is to connect with their sponsor child. 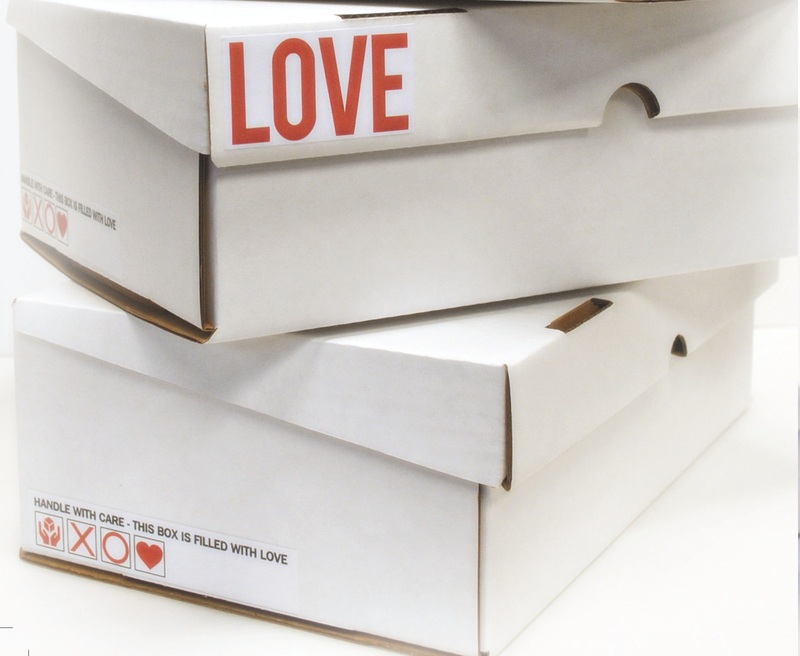 Boxes of Love now allows sponsors to fill out boxes labelled specifically for the kid(s) that they sponsor to allow for an even more personalized experience for both the sender and the receiver. And having a personal feel is the very essence of what those who started Boxes of Love envisioned for this endeavor. Each year, more churches participate in the project. This year, not only did all four Christian Life Assembly locations participate, so did Living Waters Church in Fort Langley, Port Coquitlam Christian Assembly, Highway Christian Fellowship in Sidney, and Emmanuel Church in West Kelowna. The number of boxes sent also increases each year. Last year, nearly 2,000 boxes were sent out, and this year saw even more boxes go to the children of Zambia. These boxes are packed by members of the church and local community. Those who wish to be involved, go and pick up their empty boxes and then fill the boxes with various gift items. They then return the filled boxes to any participating church location. Volunteers sort through each box to ensure they meet the content guidelines. 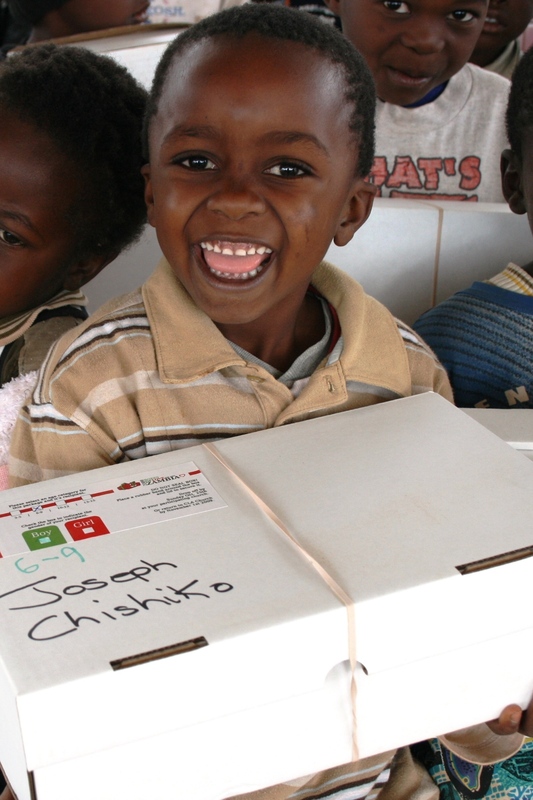 The boxes are then shipped on a container to Villages of Hope – Zambia. The container usually arrives in mid to late April, at which point they are distributed to all three Village of Hope – Zambia locations (Chongwe, Kitwe, and Mongu) and then handed out to the children from those communities. According to UNICEF’s 2008 “State of the World’s Children” Report, only 30 per cent of vulnerable children where Villages of Hope is active have “basic material goods” – simply a blanket, a pair of shoes and a change of clothes. Add that to UNICEF’s prediction of 64 percent of Zambia’s population living below the international poverty line (earning less than US$1.25 per day) and it isn’t hard to believe that these boxes may be the only gifts these children receive. Villages of Hope – Africa works to assist those living in this poverty bracket. Founded in 1999 under the Pentecostal Assemblies of Canada as a single orphan home in Kitwe, Zambia, Villages of Hope – Africa now has seven locations. They are located in Bujumbura (Burundi), Kisumu (Kenya), Lilongwe (Malawi), Kitwe, Mongu and Chongwe (Zambia), and Harare (Zimbabwe). In total, Villages of Hope – Africa cares for approximately 2,200 vulnerable children, and nearly half of these come from the various locations in Zambia where the Boxes of Love are delivered. Villages of Hope works in the form of residential housing for orphaned children. In addition, VOH provides free education to children from the surrounding communities all of whom benefit from VOH’s feeding programs, on-site clinics, and other facilities, which vary from village to village. The first Village of Hope, located in Kitwe, Zambia, also has a Youth training program for the resident children who graduate from grade twelve and need assistance in acquiring skills that will help them become “independent contributing members of society” – which is the mission of VOH. The vision of Villages of Hope is “that all children are loved and cared for.” And Boxes of Love contributes to this effort greatly. So what do you send to a child who may not receive any other present this Christmas? “I’m a good girl, so I go by the list,” says Julia. And there is a list. Boxes of Love provides detailed information regarding what is (and is not) appropriate to be put in these Christmas boxes. Recommendations include “basic need” items such as tooth brushes and Toothpaste, soap (unscented), shampoo, and school supplies and ‘fun extras’ such as puzzles, sunglasses, colouring and crossword books, underwear (unused), shoes, and candy. Things that will not be sent are any items that may spill or melt and ruin the box, such as chocolate bars, glue, and bubbles; war items including toy guns, knives and camouflage apparel; anything containing batteries, as they may leak acid, and any used clothing or shoes. Money also is not accepted – apart from the required $5 donation to help with the shipping costs of each box. Boxes are divided by gender and age group – 3-5 years, 6-10 years, 11-14 years, and 15-18 years. This way, Boxes of Love can ensure that items in the boxes are age-appropriate. Though Julia recalls from her recent trip to Village of Hope – Kitwe that age-appropriateness may not be what we would assume. When Julia was there with a women’s team from CLA, they had hoped to help hand out the Boxes of Love, but the container was delayed at customs. Instead, they asked if any of the resident children wanted to bring by their favourite items from their boxes the year before and talk about them. To Julia’s surprise, the children still had the white boxes and some of the things inside remained unopened. And she noticed how some of the boys and girls were treasuring items that we may consider ‘too young’ for someone their age; but the children didn’t seem to notice. And “lost their childhood” is indeed one of the best ways of putting it. Most of the resident children at Village of Hope are not only double orphans (having lost both their mother and father) but also do not have any other living relatives able to care for them. Their childhood was spent being passed around from relative to relative until there was no one left to care for them, at which point they ended up at Village of Hope. Nelson Lubasi was one of these children. Both of Nelson’s parents passed away when he was young and he eventually found himself with no one to look after him. 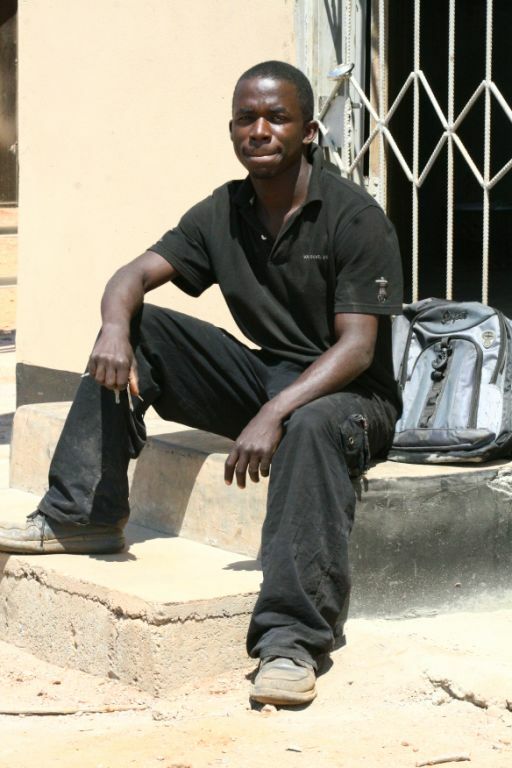 In the year 2000, when he was only ten years old, he was found homeless – living on the street outside of the post office in downtown Kitwe – by a woman who worked in the area. This woman knew of Village of Hope and contacted them to see if there was room for him to move into one of the resident homes. Fortunately, Village of Hope did have room and the woman brought Nelson to the site. Nelson then moved into one of the residential homes and began attending the on-site community school. As one of the Village of Hope children, Nelson was on the receiving end of Boxes of Love and he remembers his experience vividly. Ten years later, Nelson still remembers his first box. Nelson lists off the other items he received in that first box – a math set, toy cars, candy, tooth paste, and pens – proving just how valuable each item in every box is to those who receive them. Now that Nelson has graduated from grade twelve and the VOH Youth Program, he works as a driver at Village of Hope – Chongwe. 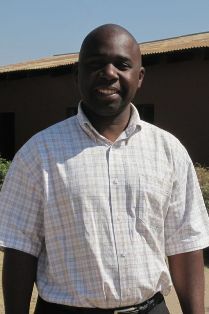 One of his current jobs is to transport the Boxes of Love from the Kitwe site to the Chongwe site (a four-hour drive). Now Nelson gets to stand on the other side and rather than being a receiver of the boxes, he gets to watch the responses of the children as he passes them out. And it was these very smiles that stood out in Kevin Eckert’s mind when he recalled his trip to Village of Hope – Kitwe in 2009 when he had the opportunity to take part in the distribution of the boxes. Kevin recalls watching the children as they patiently waited with their boxes in their laps – not allowed to open them until everyone had been handed a box. Once all the kids have their boxes, they have to wait again while pictures are taken, which are sent back to the churches involved to allow those who were involved in packing the boxes a chance to feel, if only in part, what Kevin got to experience in person. As per tradition, the kids then hold the boxes high in the air above their heads for a final photo and then put them back in their laps and drum on them with their hands. And then the excitement breaks out. Once the word “Open” is said, the patience evaporates. Just like Christmas morning, the kids sift through their boxes with urgency, holding up things to show their friends, putting on hats and sunglasses, and shoving candies into their mouths. Within no time, soccer balls are inflated and are being kicked around the field while girls hug tightly to their dolls and young boys use their box as a ‘road’ for their new toy cars. It’s something you’d expect of Whoville when the Grinch returned the presents. “It’s true joy, real happiness,” Kevin says. As with most things in life, however, nothing is perfect. And Kevin does recall one disappointment with his experience handing out Boxes of Love. He remembers thirty to forty boxes that were obviously sent by a corporation, as each box was identical and contained branded socks and t-shirts (the company’s brand, of course), and they stuck out from the rest. Some boxes simply don’t contain the same T.L.C. as others do. Those in charge of the Boxes of Love have fixed this problem, however. When the men’s team that Kevin was on returned to Langley, they told the people in charge about these boxes that seemed somewhat inadequate. Now, CLA purchases a stock of ‘filler items’ – candy, colouring books etc… – and as the Boxes of Love volunteers sort through the boxes before shipment (removing any forbidden contents, which do sometimes make their way into the boxes despite the efforts to inform against them) they ‘bulk out’ any boxes that seem to be lacking with these filler items. 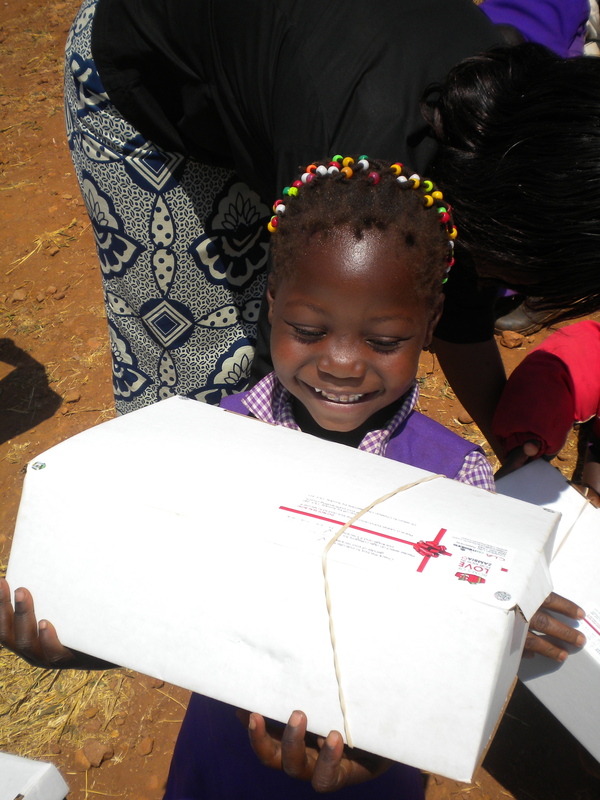 The end result ensures that each child will receive a box of the same quality that his or her friends receive. Volunteers are essential to keeping the Boxes of Love project alive. And they are needed to do more than just fill out boxes and remove toy guns. Those who help out aid in the acquiring of the new boxes each year and delivering them to the various church locations involved. Volunteers also collect the boxes when they are brought back full and put them in storage until sorting day. On sorting day, if you walk into the gym at CLA, one will find organized chaos as volunteers sort through each box, adding filler candy, removing chocolate bars, and ensuring all the boxes are closed and the lids are held in place by rubber bands – it’s like Santa’s workshop – minus the elves. It is a community of people dedicating their time to ensure that each child receiving a box feels loved. 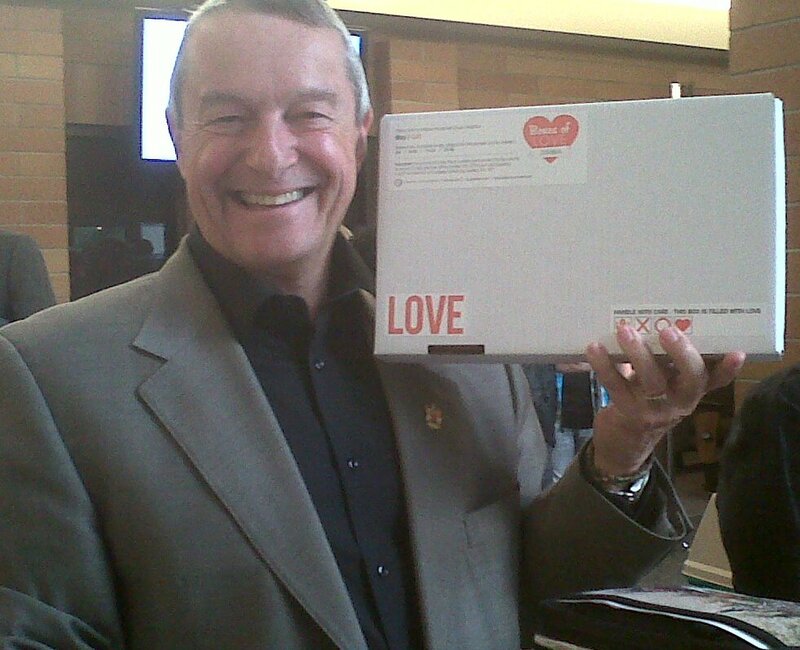 Among the boxes being sorted are those that were filled by Langley’s Mayor Peter Fassbender, who packs Boxes of Love every year. And the Mayor hopes that others will get involved as well. In fact, the Mayor believes it is important for the community of Langley to take part in any charitable endeavours. “Because it is truly impacting on kids,” Kevin says. Julia and Kevin want desperately to show their kids Africa and to give them the opportunity to share in this experience, but they want to wait until their kids are a bit older. According to Georgy Zyambo, Principal at the Village of Hope – Kitwe Community School, not only do the Boxes of Love offer a day of joy and excitement to the children of Villages of Hope, but they also have a lasting impact on these children and the local communities. Kevin struggles when asked to describe the emotions he witnessed in the Village of Hope children while opening their boxes.